As some of you — especially those who follow my Instagram feed — may be aware, my wife and I welcomed a healthy, happy little boy into the world six months ago. He’s been an absolute blessing and the center of our universe for half a year now. For most of my adult life, I was unsure about the idea of having kids. While I understood how wonderful and adorable they can be, I was also acutely aware that they demand major, long-term sacrifices of time, money, and effort — at least, if you’re going to do it right. And if there’s one thing I know about myself, something that I’ve inherited from my own father, it’s the philosophy that anything worth doing is worth doing properly, whether it’s making a sandwich, flying an airplane, or starting a family. That mindset doesn’t fit very well with the concept of having kids, because nobody ever has enough time, money, or energy for them. Not with the demands modern life places on all of us. There’s only so much you can shed in today’s world while keeping the lights on and a roof over your head. Economic, personal, and societal factors are in constant flux, which doesn’t help. I’ve always been of the opinion that raising a child is not something any parent can afford to get wrong. You can screw up a lot of things in your life — your career, your finances, your education, your personal relationships, your health — and the collateral damage will generally be limited. But I’ve seen first-hand what happens when people don’t raise their kids well. It sets up a repeating cycle of failure and dysfunction which can extend for many generations. Kids are a big commitment, one I’m not sure most parents appreciate prior to the fact. Perhaps that’s for the best. Overthink it too much and nobody would ever take the plunge. Eventually humans reach an age where you either jump in with both feet or risk having Mother Nature make the decision for you. Sure, modern science makes it possible for even 70 year olds to have kids, but that can cost tens if not hundreds of thousands of dollars. It comes with increased risk of birth defects and abnormalities. My own parents were on the older side (nearly 60 in my dad’s case! ), and I was orphaned at a very young age. While my father was an exemplary parent, that’s not a fate I’m interested in foisting on my own progeny. For my wife and I, the decision to wait was no decision at all, because we didn’t start dating until our mid-late 30s. By the time you get through the engagement, wedding, honeymoon, and get your lives set up, a couple more years have gone by… and the clock keeps ticking. His first photo. He was about 15 minutes old when this was taken. Obviously we did decide to start a family, and I have to say it’s incredible how seven pounds of flesh can change your life. I’m at least somewhat adept as a wordsmith, but I’ve been staring at the screen and beating on the backspace key for the better part of an hour trying to express what it feels like to see your son’s little face for the first time. I certainly wasn’t prepared for the emotional impact or how, like a bolt of lightning, it instantaneously changed my priorities and became the defining moment of my life. This may not be evident to those who know me. After all, we still live in the same place as before. We do the same things, have the same friends. Yet everything is different. I really miss my little copilot when I’m away. It’s especially hard because “being away” is a major, permanent part of my job rather than something which will abate in a few months after some consulting project winds down. My boy’s already grown and changed so much; it leaves me sad about every moment I’ve missed. But someone’s gotta earn the money, right? 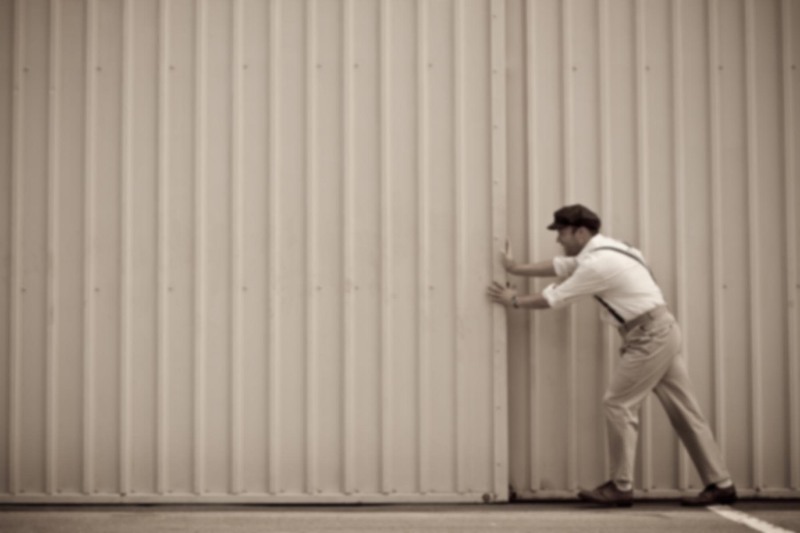 Even those with typical 9-to-5 jobs (do those even exist anymore?) are gone a lot, often leaving early in the morning and not returning home until baby’s bedtime. As always, the struggle is for balance and sustainability. From pauper to tycoon, that seems to be the one thing we all have in common: a constant search for the best possible trade-off between time and money. That’s one thing I learned as an instructor: student pilots almost always faced a dearth of one or the other of those resources while pursuing the dream. Speaking of flying, my employer has been wonderful during the whole pregnancy and birth process. We’ve been through all sorts of genetic testing, added ultrasounds, doctor appointments, and so on. They’ve been very supportive. I know that’s not easy for a charter company to do, especially one that’s growing rapidly. The charter business is a tough one because you never know when a broker or other customer will suddenly demand service. Sometimes the company has only a couple of hours to arrange an aircraft, crew, hotels, rental cars, catering, fuel, landing permits, maintenance and flight releases and the other things that go along with it. How’s the weather? Is the airport adequate? Are the crew members up to date on their recurrent, international, company, emergency, and other training? It’s not as simple as turning the key and starting your car. With the company’s cooperation, I managed to string together nine weeks off from work. That’s more than any other person I know has managed to take off — and I’ve asked a lot of people! I normally get about a week of “hard” time off each month. To this I added two weeks of accumulated vacation and six weeks of Paid Family Leave. 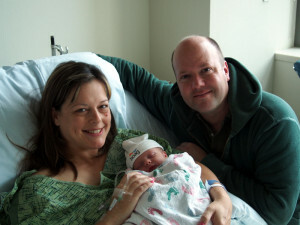 Since our son was born via Caesarean section due to his being oriented backwards (or “breech”) in the womb, the time off was useful not only for bonding with the baby but also helping care for Kristi. A C-section is major abdominal surgery, but sometimes the mother’s recovery ends up taking a back seat to the new infant. Who wouldn’t love that face?? One of the most commonly asked questions by friends and family is if Daddy’s Copilot has been up in the air yet. He hasn’t. I can almost hear the chorus now: “What kind of father are you? !” Early on we were worried about his hearing. Wee ones are more susceptible to hearing damage from extended exposure to high decibel levels than adults. Plus we really want his first flight experience to be a positive one. Much like clothing, it turns out that infant hearing protection ($30) is far less expensive than the full-size version ($1,100). 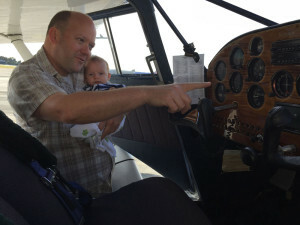 The primary stumbling block has been figuring out how to fit a car seat into a cool enough airplane (read: tailwheel) to be worthy of his first flight. I’ve got access to a four-place 1946 Stinson 108, but the lower cushion of the rear seats are supported by what’s essentially a canvas sling. A clever, lightweight design feature. But fitting a modern car seat into that contraption would be challenging at best. Would it be safe? I don’t know. Even if it was, infant seats face aft, so he’d be looking at nothing but the rear bulkhead. I suppose once we were airborne, he could come out of his seat for a look around. Sudden stoppage in mid-flight is not something which is likely. Or likely survivable it it does happen, regardless of how well one is strapped in. As long as he’s belted in for taxi, takeoff, and landing, I think it would be both legal and as safe as reasonably possible. Next question, will he be a pilot? I don’t know. And I don’t really care. Mommy took him to the ballroom and he loved being out on the dance floor. She then brought him over to the airport where he cried while I was showing him the Stinson. To be fair, it was a windy day and the roar of 737s departing at John Wayne Airport didn’t create the most baby-friendly environment. Honestly, I don’t plan on being one of those dads who insist that his son learn to fly. I remember seeing student pilots like that. They weren’t there for their own reasons, but rather because dad arranged the whole thing. What a waste of time and money! Of course, I certainly won’t discourage my son if he’s inclined toward aviation. But flying is my thing — it’s what I do, what I love. He will have to find his own passions and activities. If they happen to be the same as mine, I will joyfully share them. But it doesn’t matter to me what he does as long as he’s happy. My hope is that he will find his footing in this unstable world, and that his presence on Earth will make the world a better place, not a worse one. I was serving on a criminal jury at the Orange County Central Courthouse in Santa Ana last week. The hundreds and hundreds of jurors called each and every day for duty there are testament to how many little boys and girls end up as a detriment to the community. I also noticed how many homeless people are camped out in seemingly permanent fashion around the federal buildings, courthouses, and other civic edifices. While ambling back from lunch one day, it struck me that these ragged 50 year old guys, mumbling to themselves while fishing rotten chicken bones and sticky aluminum cans out of public trashcans, were once exactly like my son: someone’s sweet, cute, fresh-smelling little pride-and-joy. A clean human canvas. And now? It’s sad to think there are parents out there who tried to raise a kid the best way they knew how, and this was where they eventually landed. But it was also an excellent reminder that whether or not daddy’s copilot really does become a pilot is not an important thing. What matter is that he’s my son, the foremost element of life, the one whose big smile and crinkly eyes brighten every morning and remain in my heart wherever wings may take me. Deeply heartfelt congratulations from Downunder! Thanks David! Good to know he has fans in all corners of the globe. Speaking of Downunder, it sounds like CASA is making a mess out of general aviation down there! I gave up trying to pass judgement on CASA ages ago… (Try to unpick the unmitigated chaos that was their 2003 attempt at airspace reform some time.) Personally, I think they do a lot of really excellent work. But like most government alphabets, the sensible elements are badly outbalanced by the pedantic, painful minority of pedagogues. It’s the one thing that makes parenthood look simple – while you will get overwhelmed with advice, you ultimately get to make your own decisions. I loved loved reading this article. Thanks Ron for sharing your journey. No doubt in my mind you and Kristi will be outstanding parents. And then one night he won’t wake you up. 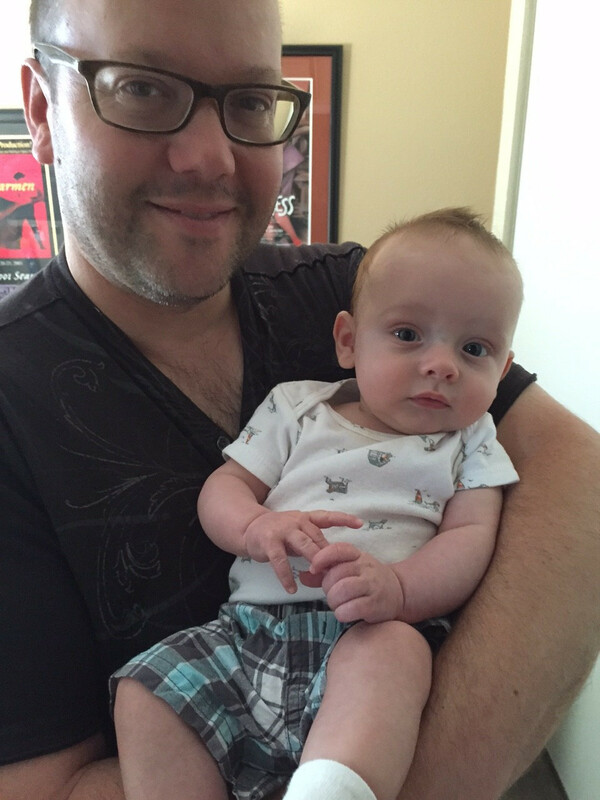 You’ll wake in the morning in a panic and discover that the little guy is just growing up and can sleep all night. No doubt raising a child is a daunting task (I have 2) but it is well worth the effort. Congrats. Thanks Mac. I can already see subtle shades of the grow-up-and-fly-the-coop thing starting to happen. He’s not moving off to college any time soon, of course. 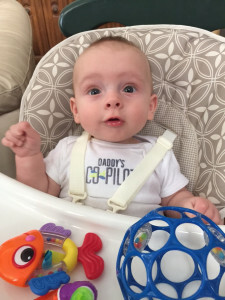 But it’s the little things — the way he can hold a bottle himself, for example, or that favorite little baby outfit he’s now outgrown — that make me a little sad about how quickly things change. Jerry Seinfeld talked about this on an episode of “Comedians in Cars Getting Coffee”. He said by the time a kid is seven or eight, mom and dad are already in second place when it comes to things like technology, and it’s all downhill from there! Congratulations, Ron! Your comment about “anything worth doing is worth doing properly” really hit home with me as we waited a while before my daughter was born. Of course, you never feel ready when it actually happens, but something tells me that you’ll do great. When the day comes and your son actually does fly with you, when he can actually peer outside and manipulate the controls to good effect, it’s the best feeling in the world (ask me how I know)! You are too kind, sir! As someone whose career does not involve flying, I am embarrassed to admit that the birth of my daughter led to some angst. Would I have to give it up? Should I just sell the airplane now? It was my wife who called out these thoughts as nonsense. Obviously, eight years later, I know better. Flying with my daughter has only added more depth and joy to the experience. As you might guess, that applies to far more in life than just flying. Again, congratulations to you and your family! I sympathize completely with that angst — in fact, I’d bet many pilots go through that. I did — and I fly for a living! But it’s not the same. It’s the recreational flying, the stuff we do for fun — that’s what would be painful to lose, because that’s the sort of aviating which feeds the soul. With spare time already in such short supply even before he was born, I was thinking I’d never get to fly much either. Hopefully, like you, I’ll look back eight years from now and laugh at how silly and naive I was. Many congratulations to you and your new family! This was a joy to read and I’m sure that your son will have all the support he needs to reach for the stars in any way that best suits him. Thanks JP, and congrats to you on your recent checkride success. It’s easy to get bogged down with negative news when reading about aviation. The high cost, the challenges, the regulations, etc. But that just makes the good stuff that much more uplifting, I think. Whether she becomes a pilot or not, the flying adventures will definitely stay with her. It might be surprising to her that not everyone comes from a flying family, or that some people even find it scary. I remember every flying-related thing from my childhood. Even the littlest moments can be so significant when you’re young! Ron, here in Venezuela our main staple food is called “arepa”. It is a sort of a thick corn tortilla. Years ago, a youth friend -Hermes- who has recently had his first baby, told me that he was not worried because ‘kids come with his arepa under the arm’. At first, being Hermes a well natured and responsible guy, I was horrified by his comment. But after life and facts give sense to his words. Ron, if you love, you care for your child, your family, don’t worry there going to be efforts, sacrifices, late late shows, but ‘kids come with his arepa under their arm’. Because they, like a prayer, for good man or woman, a loving parent, kids make you do the rigth things, all the sacrifices and vigils it take. I knew that the first time I hold my grandson, when he was 30 minutes old. That’s quite a saying! I understand exactly what he means. The language may change, but parenting is pretty much the same the world over…. although I don’t think I’ll ever look at arepa quite the same way. 🙂 Thanks for the story, Guido! Ron, I am a glider pilot here in Scotland. My boy is due in 2-3 weeks. I couldn’t put it any better. Really nice piece of writing. When I think of raising my boy, I’d love him to fly, but this is his decision. What I want to give him though is the set of skills, like hand ball coordination, so a lot of sports. I want him to try as many different things as possible. This is the only way I now to find one’s passion. Flying gliders in Scotland sounds fantastic. There’s so much amazing topography to see. Congratulations on your upcoming bundle of joy! 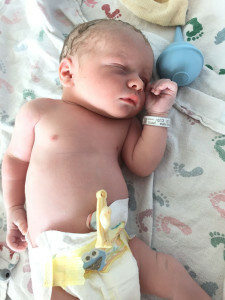 Life is about to change for you, my friend… but it’s well worth the sleepless nights and whatnot. I think yours is a great philosophy. It’s a big world out there. Expose him to as many different things as possible to he’ll be able to figure out what he loves — and doesn’t love — to do. As usual, another excellent article! Good to hear that although your passion in life is flying (and writing), you’ve found something far more important than aviation. Work is a tough nut to crack. Obviously we all have to have a job, and the “new economy” is full of non-traditional work schedules. I think that’s one of the hardest parts of modern parenting. Congratulations Ron and Kristi… Future pilot – or not – matters not. Outstanding. Thanks, Ben! Even if he’s not a pilot, I hope he’ll appreciate the miracle of flight and the freedom it represents to so many of us. Happy to bring the DA40 down to Sunset (away from the 737 jet noise) and let you fly all four of us out to Catalina. Wow, that is an extraordinarily generous offer! If you’re serious, I might have to take you up on that. It’s hard to argue with the comfort, reliability, and safety record of a DiamondStar. I’ve always been a big fan of that airplane… and it’s good to know that car seats work well in the back. Plus it’d be great to finally meet you! 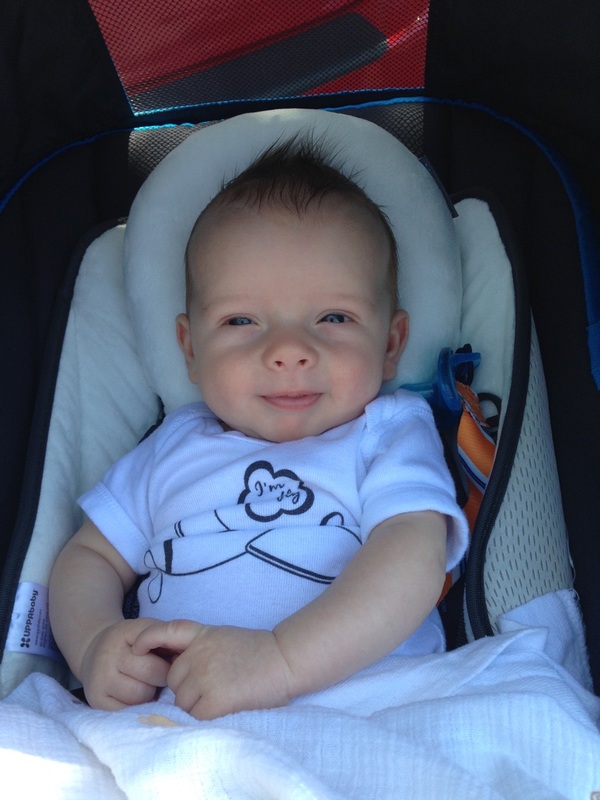 Great blog post Ron – what an incredibly cute son you have! My kids have been teens for several years now – I can hardly remember what it was like when they were little and adorable. I was going to lament this, especially after the younger one asked for a ride to school on a morning when I was already frazzled and running late. But then the older one (who works nights and had already gotten into his PJs) offered to take his sister to school for me. Yay! Teens are great! At least for today. ;o) As for being a parent, it’s one of those things you learn by doing and I’m sure you’ll do a wonderful job! 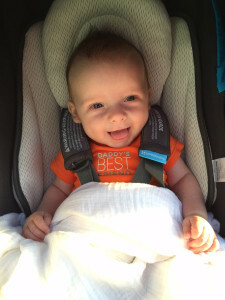 I can’t wait to hear all about his first flight! He *is* cute, isn’t he? He’s gonna get away with all sorts of stuff because of that, I can already tell. Congratulations Ron, having five daughters and 12 grandchildren and three great-grandchildren it’s easy for me to say that it’s a wonderful honor and pleasure to have children. I know you will make an amazing dad and I know that you will be a blessing to your son as well. Five daughters?? I’m impressed! I can’t imagine raising five kids. Of course, I couldn’t imagine raising even ONE until our son was born, so I guess it’s all relative. We have a neighbor who had triplets about a year ago. They went from two people living in their house to SIX literally overnight (three infants and an in-law who moved in with them). It always amazes me what we are capable of when we really put our mind to it. Loved this, Ron. Great job. Nice to see something new and different on the blog, although you mix it up quite a bit from post-to-post. Chelsea and I, as you know, are looking to start our family soon. You took the words right out of my mouth as far as how important of an endeavor this is. If I fail at everything else in life, I don’t really care. The one thing I CANNOT fail at is being a father. This is something I’ve always known. I think perhaps we have a common bond as well when it comes to our perspective on God’s Children and His family. We have common beliefs there. And to me, this is all just as much spiritual as it is common sense- raising children is the most important job on earth. Thanks Chris! I think the AOA project we’ve been working on together is excellent training for having kids — it’s got that “herding cats” element and requires a lot of patience on your part. 🙂 Seriously though, you and Chelsea will make excellent parents; I look forward to seeing you both enjoying the wonders of parenthood! Congrats on the addition. Beautifully said as always. I have had so many of the same thoughts in the seven years since my first arrived. As she gets older I am starting to see the results of some of our efforts. Like you said, it is their happiness that really matters and not what I want them to do. I just want to be around to support them. That’s got to be one of the most rewarding moments in the life of a parent: watching your progeny bloom, the investment of time, effort and love start to show dividends as they mature into the person they were meant to be. And it’s got to be a bit of a relief, too, knowing that you really “did good”.